I wait for the protests to begin. I will be told that I am learning something that is simultaneously “dead”, “boring”, and “useless”. Obviously, no rational person should care about the past. Ironically, the minute these same people hear a retelling of the past that they don’t like, emotions flare up. Don’t believe me? Try telling people that most of the Australian soldiers in the First World War signed up due to their loyalty to Britain. Or that Anzac Day is a celebration of dominant mythology that marginalises contradicting human experiences. If you want to avoid criticism, don’t shout these too loud. People care about their national history more than they will admit. This brings us to that time of year again. Australian flags can be found invading every convenience store, house and pair of thongs on the market. Anzac Day is something I never really questioned as a kid. It was a day filled with wreaths and older people in funny khaki uniforms with shiny medals hanging off them. I remember being sad and not knowing why. Today, the tradition is much the same. Everyone is engaged in the usual business of patriotism. My tradition involves a local Anzac Day march and day with the family. It is an important day of remembering. However, over the years I have noticed that my “one minute of silence” is preoccupied with thoughts of one thing: the Australian men who have fought in “our” wars. This begs the question: Who was I forgetting to remember? It is clear that Anzac Day has evolved. No longer is it confined to the men who fell on the Western front or at Gallipoli. It has been broadened to include almost any war that Australia has been involved in. Anzac Day presents the dominant story – brave innocent larrikins who were slaughtered by the enemy. And some of this is true. But what is important is that we don’t allow blind patriotism to marginalise any contradicting story. And there are plenty to be told. In the ‘80s and ‘90s, Australia was reluctant to acknowledge many men and women who had fought for their country, including ex-servicewomen and those who had served in merely “minor” wars. Another incident occurred on Anzac Day 1981 where fourteen Australian women were arrested when they attempted to march to remember women raped in war. The next year, 250 women attempted to join the end of the march but were stopped by police. These women could not march because it directly challenged our myth of the innocent heroic Australian soldier. We are unwilling to admit that our stereotype of the Aussie digger may be overly glorified. As a result of our forgetting, many raped women continue to exist in the shadows of our history textbooks. 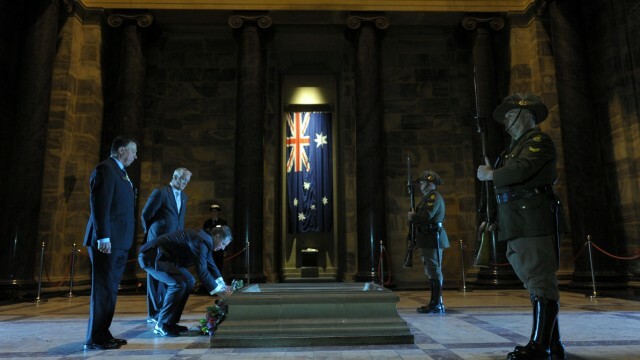 Yet today the story is the same – there is another silent war that remains unacknowledged each Anzac Day. It is swept under our national carpet like a Cold War conspiracy. I have never been to an Anzac march that acknowledges the wars of Indigenous Australians. I was talking to some friends about it the other day, and heard the usual nonchalant comments. I (tactlessly) pointed out that some historians have estimated that frontier violence in Australia roughly halved the Indigenous population. Silence ensued. Eyes turned downwards. Someone changed the subject. Australian historian Henry Reynolds estimates that frontier warfare resulted in 20,000 Indigenous deaths but notes that this estimate may be too low. Other estimates, such as those by Bruce Elder, place the highly contested figure as high as 100,000. This is uncomfortable for us to hear. It’s unsurprising that former Attorney General Michael Lavarch’s Bringing them Home report of 1997 sparked controversy in its finding that the Stolen Generation amounted to genocide. Earlier this year, Tim Flannery, former Australian of the Year, expressed his horror that Indigenous Australians in the frontier wars are not recognised by the Australian War Memorial. Maybe my friends are right – it doesn’t help to dwell on the past. But it also doesn’t help anyone to pretend it didn’t happen. I am not advocating that we cancel Anzac Day this year. The overwhelming horror of war and its losses cannot be understated. We should use the day to remember our fallen soldiers and loved ones. However, let us also remember those forgotten stories that are struggling in the corners of the national consciousness, and, importantly, those of Indigenous Australians. Stories that need the power behind our much-recited mantra: Lest we forget.